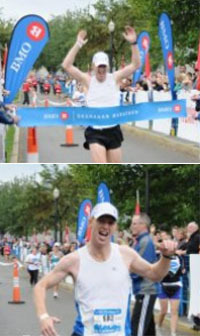 Marathon Champion James Curran — St. Finbarr's A.C.
Barr’s member James Curran currently living in Calgary, Canada won the Okanagan marathon on the 9th October, 2011 in a time of 2.44.54. James was third after 10k, at halfway and at the 30k mark where he was 47 seconds behind the leaders. He produced a brilliant last 12k however to win by 2 minutes 50 seconds. James ran a negative split with his second half faster by 2 minutes 36 seconds. Congrats James on a fantastic performance and a great achievement!